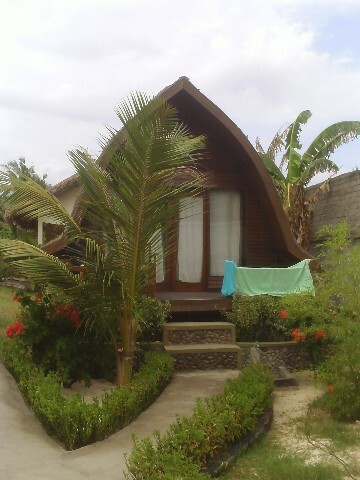 Blue Beach Cottages on Gili Trawangan has a choice of bungalows or standard rooms. With really nice decor inside the rooms they have air-conditioning, hot and cold water. The cottages are just 5 minutes walk from where the boat drops you off on Gili Trawangan. From the beach turn to the right. There are restaurants and bars very close though far enough away that the loud music doesn't disturb. All rooms have air-conditioning and hot and cold water. Horrendous. I had a large sum of money stolen from my locked room followed the next day by my credit card from the safe AT THE RECEPTION DESK. I was treated appallingly by the staff who called island security, not to help me but to ensure I didn't leave without paying. Add in the cockroaches and bed bugs and I can honestly say it was one of my worst travel experiences. Really nice rooms, great beds with mosquito nets. Close to some great bars. There is a mosque right behind so you get to calling to prayer 5 times a day which does start a bit early (before the sun rises) though saves you wearing a watch. It wakes you up in the morning to go for a swim before breakfast. tells you what time to have lunch, what time in the afternoon to go a swim and a drink on the beach and then tells you when to go have a shower and get ready for dinner. Have you stayed at Blue Beach Cottages - Gili Trawangan?